Ingredients: Enriched Wheat Flour (Flour, Niacin, Reduced Iron, Thiamine Mononitrate, Riboflavin, Folic Acid), Chili Pepper and Other Spices, Onion, Salt, Caramel Color, Garlic, and Citric Acid. Brown 1-pound ground beef (or ground turkey). Drain off excess fat. Add two 8-ounce cans of tomato sauce (or one 1-pound can tomatoes) and one 1-pound can kidney beans. 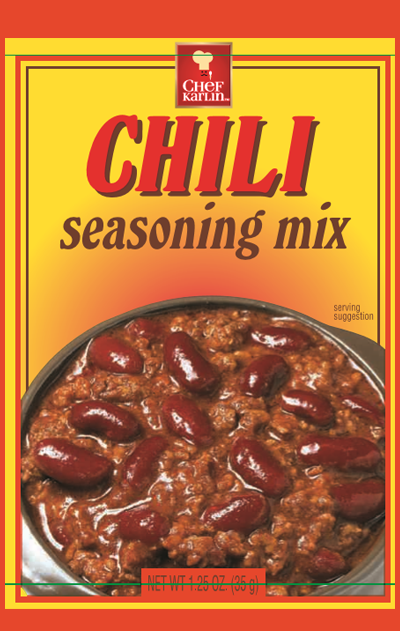 Stir in Chili Seasoning Mix. Cover and simmer 10 minutes. Microwave beef (or turkey) on HIGH for 3-5 minutes; drain excess fat. Add ingredients as directed above. Microwave on HIGH 3 minutes. Stir chili and rotate bowl. Microwave another 3-4 minutes on HIGH.